I start looking forward to berry season as soon as it starts to look like spring is on it's way. I admit that I am somewhat of a giant fan of berries of all kinds, but especially blue berries.I like them so much that at this time of year, I have a small bowl of them for breakfast every morning.I buy so many blueberries that I often get carried away when they are on sale this time of year and end up with lots of extra. I don't want them to go bad, so I freeze them. Freezing blueberries is extremely easy and only requires that you lay them out on a piece of parchment paper on a jelly roll pan in the freezer and then place them in containers for later use. Make sure you wash them and dry them well before freezing. Frozen blue berries work in nearly every recipe that requires baking them and they are also a great summer snack by themselves! As you can see, I had no trouble finding blueberry recipes, but I wanted to make them recipes that were not the common ideas such as muffins or pancakes. 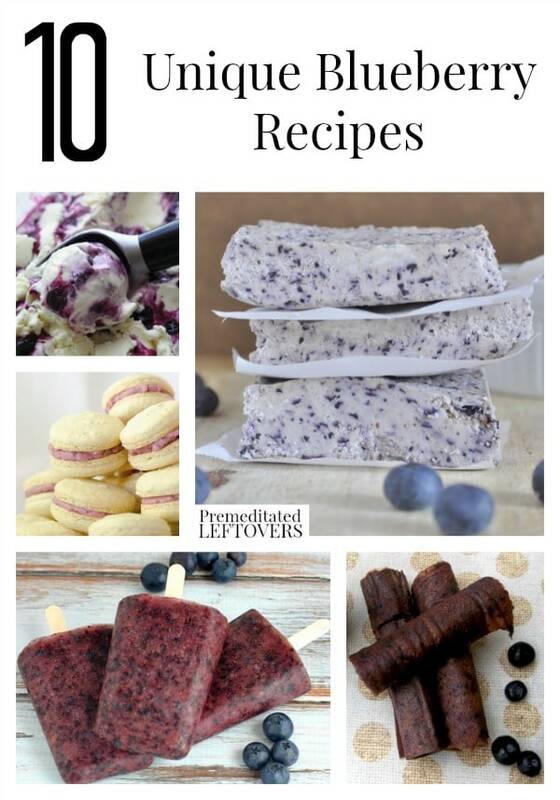 Here they are; 10 unique blueberry recipes that are sure to brighten your day! Kick off your morning right with a delicious Sweet Blueberry Banana Smoothie from The Slow-Roasted Italian. Simple recipes with as few ingredients as possible are some of the best. These Blueberry Bliss Bars from My Whole Food Life look delicious! Try this Blueberry Cheesecake Ice Cream from La Famille Noire for an extra great way to use up frozen berries. Blueberries star in these Easy Homemade Blueberry popsicles that are so simple to make and way better than the ones bought in stores! I bet you have never tried blueberry donuts before! Make these Blueberry Oatmeal Muffin Donuts from Bear and Lion for an extra dose of awesomeness. Blueberries for lunch? Sure you can with this Salmon and Blueberry Salad! Drink your antioxidants with this awesome Blueberry Tea recipe from Lady Behind the Curtain. Make your own fruit roll-ups with this recipe for Elderberry Blueberry Fruit Leather from Saved By Grace. Another great meal idea with blueberries is this Blueberry Balsamic Glazed Pork Tenderloin from Make from Pinterest. These French Macaroons with Blueberry Buttercream Frosting from Following in my Shoes look absolutely gorgeous and very delicious. That’s an awesome idea – I didn’t know you could freeze them.